Texas Parks and Wildlife (TPWD) staff have been busy recruiting landowners to participate in the Texas Playa Conservation Initiative, which is designed to restore the natural function of playas by backfilling pits and trenches in playas surrounded by grass—at no cost to landowners. The partners currently have contracts to restore approximately 400 acres of playas in Lubbock, Swisher, and Crosby counties, with another five contracts pending. Five of the contracted projects, encompassing 205 acres, have already been completed. Many of these pits and trenches are no longer in use, and by filling them playa hydrology is restored to benefit local residents and wildlife. Once a pit is filled, rainwater and runoff can again reach the entire playa basin, including the large cracks in a dry playa floor—which is essential for recharge to occur. The shallow water that spreads across the playa also allows plants and insects to flourish, which in turn provides important food and habitat for migrating birds and other wildlife. The Texas Playa Conservation Initiative is a partner-driven effort to restore playas in the Texas Panhandle. The goal is to provide wetland habitat for wildlife and improve the quality and quantity of groundwater recharge through playas for the ranchers, farmers and local residents who live in the area. Partners include Texas Parks and Wildlife Department, Playa Lakes Joint Venture, Ducks Unlimited, USDA Natural Resources Conservation Service, US Fish and Wildlife Service, Texas Agricultural Land Trust, Texas Grazing Lands Coalition, Texas Tech University, The Nature Conservancy, Texas A&M AgriLife Extension, and Ogallala Commons. 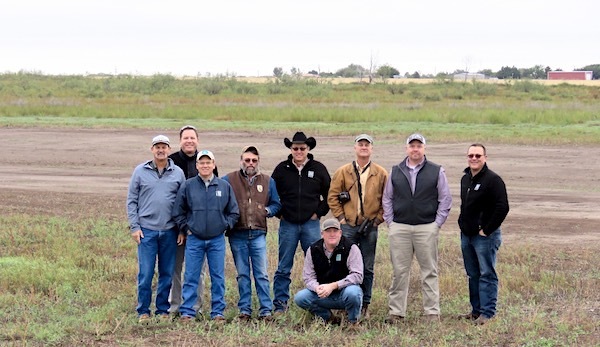 Photo: In October, the Steering Committee (Left to right: Duane Lucia, USFWS; Jeff Raasch, TPWD; Calvin Richardson, TPWD; Jude Smith, USFWS; Billy Tarrant, TPWD; Kevin Kraai, TPWD; Christopher Rustay, PLJV; Kevin Hartke, DU; and Don Kahl, TPWD) visited a recently restored playa in Lubbock County, Texas. Photo courtesy of TPWD.